This is yet another testimony to the amazing, life-saving therapy of Acres for Life. Monica’s childhood was nowhere close to idyllic. Instead, it was brutal. Monica’s mother had been left on the doorstep of an orphanage as a baby. She wasn’t adopted until age seven. Her adoptive mother bitter at her own inability to have biological children offered her no affection. As an adult, she had six children that she didn’t know how to love. After a mental breakdown she and her husband divorced, the sons went with dad and the daughters stayed with mom. At nineteen, Monica was kicked out of the house. Life had been hard as a child and not much easier as an adult. She put two daughters up for adoption and was a single mother to her son. Everything was a struggle. Monica with Magic, the horse that was very influential in her therapy. Once her son was out of the house and on his own she sought help through the county and started therapy. She was in a dark, dark place desperate for hope. She had been in and out of therapy for fifteen years with no success. Some lessons in tapping therapy did provide some help, but it wasn’t until the therapist asked how she felt about horses that things began to really change. A lifelong animal lover, Monica was very open to the idea. 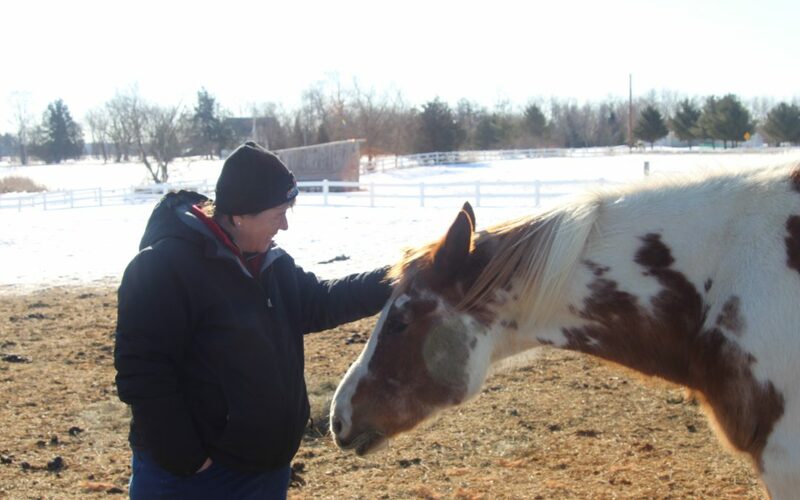 Before beginning the equine therapy Monica had a dream of being surrounded by horses. However, at her first session, not one horse came near her. She left feeling down and confused. After the session, she went to the grocery store with her hoodie up and her eyes down. It occurred to her then that she was pushing life away – hoping to be invisible. At the end of her second session, a horse made contact with her. The horses began to see her as she began to see herself. Monica had spent her whole life running. Running from all the hurt. It was time to stop. Over the course of seven months, Monica’s sessions with the horses transformed her life. She realized she’d also been running from the truth. The folks at Acres for Life believe the answer lies within each client. That empowers people to play a critical and active role in their own healing. Sometimes that means realizing truths and remembering things that hurt. In Monica’s case, it meant remembering an especially pivotal day from her childhood. At the age of sixteen, Monica’s mother took away her dog Heidi and dropped it off at the pound. Monica overheard her step-father comment that Heidi had not gotten adopted and would be euthanized. Monica went to school and asked her teacher what euthanized meant. As you can imagine, she was heartbroken. She returned home from school feeling deeply sad. That dog was the only love she knew. She went into the basement and fell to her knees on the thin rough carpet that covered the cement floor. She determined that if her dog was going to die she might as well die too. She then proceeded to slam her head down onto the floor as hard as she could. The third time knocked her out cold. She came to as her mother yelled repeatedly to get up. No concern for her daughter’s well-being, she cut her long hair into bangs to cover her battered forehead and never said a word about it. Monica had spent thirty years living with the effects of a traumatic brain injury without even knowing it. She had always wondered why life seemed so much easier for others. A missing piece to her puzzle had been put into place. In the face of so much pain and unfairness, Monica’s faith was strong. It has been deepened and become more personal through this healing process. At the site of her childhood home, where so much damage was done, there is now a labyrinth. A school purchased the land, tore down the house, and installed a labyrinth. Monica visited the labyrinth, hugged herself, and prayed for healing. Three months later she began spending time with the horses. She returned to again walk the labyrinth a year later and praised God for all he had done. Life had come full circle. Monica with the horse that had represented her mother during her treatment sessions. Monica’s life has been restored in so many ways. She has contact with her two birth daughters, whom she describes as stunning. She has a loving relationship with her son and daughter-in-law. She is a grandmother. 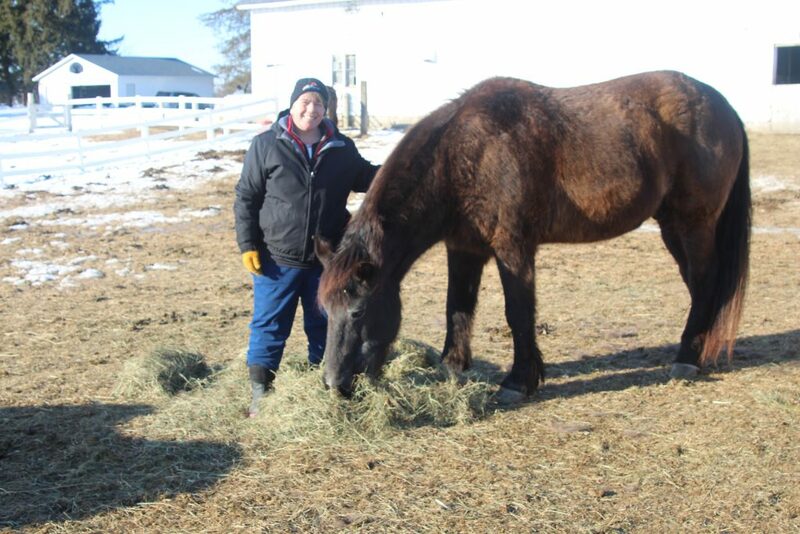 She is training to become an equine assistant at Acres for Life to help others reclaim their lives. Perhaps, most stunning of all, Monica reached out to her mother. Her mother admitted to the wrongs and explained she’d done the best she could. That was enough. Monica and her siblings recently gathered together for their mother’s 80th birthday. Monica describes this experience as opening her eyes for the very first time. Where once there was only pain there is now joy. She credits the incredible staff and horses for guiding her to a new chance at life.